You’re hiking streamside through a rhododendron tangle when you hear a short, musical trill – it kind of mimics the riffles in the stream. I know, you’re in a hurry – got a lot of hiking to do, but if you have a minute to track this little chorister down you won’t be disappointed. What you’re hearing is a Canada warbler. This little warbler (about 5 inches) is common in Western North Carolina, in brushy (often rhododendron) habitat, mainly above 3,500 feet. It seems to prefer streams, springs and/or bogs and seeps but water is not a deal breaker as long as the understory is dense and the forest is cool and dark. The Canada warbler is quite active often taking insects on the wing. This habit led to a couple of colloquial monikers from the north country – Canadian flycatcher and Canadian flycatching warbler. The Canada warbler is bluish gray above, no wing bars but a complete white eye ring makes it look “big-eyed.” It is bright lemon-yellow below and the male has a dark black necklace across its chest. The female is similar, just more muted with a pale necklace. And while it is a denizen of the tangled understory it is often easy to spot. First, as mentioned above, it is a quite active forager so you can usually catch the movement and follow it till it comes to rest momentarily, perhaps to wolf down a moth it just caught. Second, they respond pretty well to phishing – you know that weird sound birders make that is half way between ppssssttt and whoosh. The bird’s common name refers to the fact it was discovered in Canada. And the majority of the North American nesting population still calls Canada home. Around 65 percent of the population nests in Canada’s boreal forests. They can also be found around the Great Lakes, New England and down the spine of the Appalachians to north Georgia. While they are common at higher elevations in the moist woods of Western North Carolina, if you want to see one you should probably get out soon – they don’t linger. They are one of the latest Neotropical migrants to arrive on nesting territory and one of the earliest to leave. Because we are near the southern end of their nesting range, Canada’s are with us for three to four months. In Canada they may be on nesting territory for only two months. They normally raise only one brood per year and are often back on their wintering grounds in South America by September. 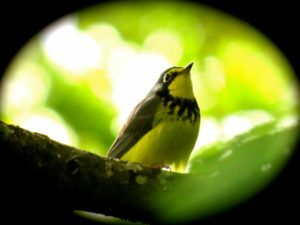 There is currently some confusion regarding the population status of the Canada Warbler. They have been listed as threatened in Canada since 1998 and the North American Bird Conservation Initiative lists them as a “Highest Priority Landbird.” But the IUCN (International Union for Conservation of Nature) lists them as a species of “least concern.” Like most woodland species, loss of habitat and continued development are its greatest threats. So when you hear the tinkle of fairy laughter coming from that tangle of rhododendrons be on the lookout for our resident Canuck, eh.